I miss elementary school and those little Valentines we were obligated to give to everyone. No one was ever left out, everyone had a Valentine. Lessons were cut short for the day so we could enjoy the holiday with bags of potato chips, boxes of delivered pizzas, and what seemed like an unlimited supply of conversation hearts and cherry lollipops. Those were the simple times when girls would be happy with a piece of candy taped to a small card. Oh, that is so not the case anymore. I want a dozen Sprinkles cupcakes with a pair of diamond earrings taped to the box. I don’t think any woman would disagree. 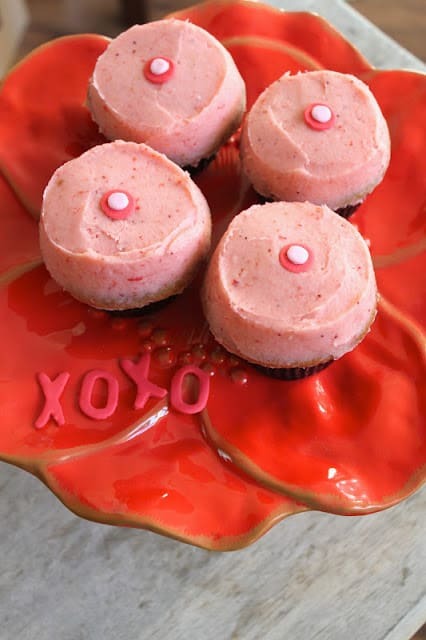 When I was in college (when you no longer send Valentine’s cards because you’re too cool and cultured for those frivolous things), Sprinkles Cupcakes was the craze. I lived in Westwood at the time, just a short drive to Beverly Hills where the first Sprinkles location opened. My roommate and I would skip class or reward ourselves for making it to class, by driving Bev Hills to get our cupcake fix. This was when getting Sprinkles meant waiting in a ridiculous line that went around the block. Thank you Sprinkles for putting cupcakes on the map. 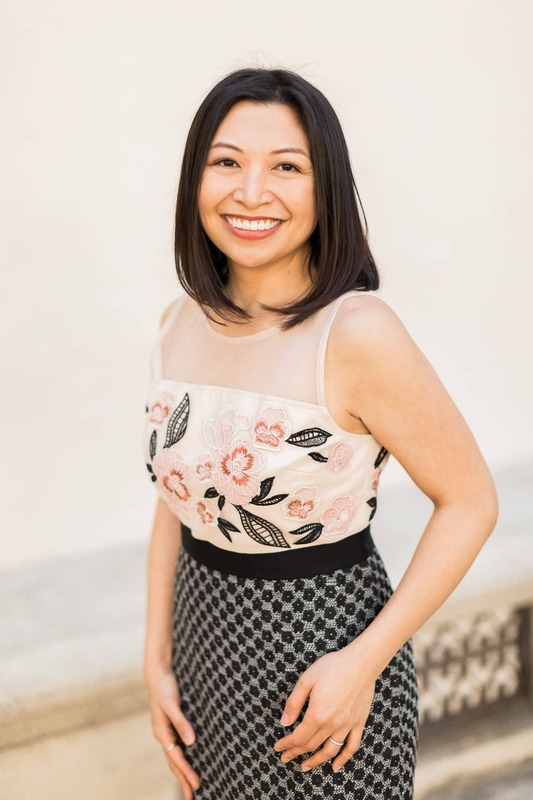 Candice Nelson took cupcakes to another level, turning the pastry world upside. What was once made at home with box mixes and canned frosting became a gourmet, highly desirable commodity. It encouraged people to make better cupcakes. There was more focus on appearance and flavor than ever before. In elementary school, I had the choice of vanilla or chocolate. Nowadays, you get combinations like maple bacon, blueberry cheesecakes, and s’mores cupcakes. Despite the availability of cupcakes around me (Sweets for the Soul, Lark Cake Shop, Crumbs Bakery to name a few), I don’t think anything beats a homemade cupcake. To make my cupcakes unique, I enlisted the help of my favorite secret ingredient. In this case, ground freeze dried strawberries. Freeze dried fruits give baked foods this vibrant natural color that is unattainable with food colorings and gels. Without it, these strawberries cupcakes would turn out tan or light brown in color once baked. Strawberries are out of season in the Winter, but thanks for the marvels of modern farming and technology, you can get strawberries and practically any other fruit throughout the year. However, these fruits may not be the sweetest because they are not at their natural peak. Freeze dried fruits help to bring out the natural flavors of the fruit without the addition of extracts and imitation oils. Its also a good idea to buy frozen fruits for baking. More specifically, frozen fruits that are IQF (individually quick frozen) which are picked and frozen at their peak. Therefore, they tend to be sweeter and much more flavorful. They work well in recipes that require fruit purees. 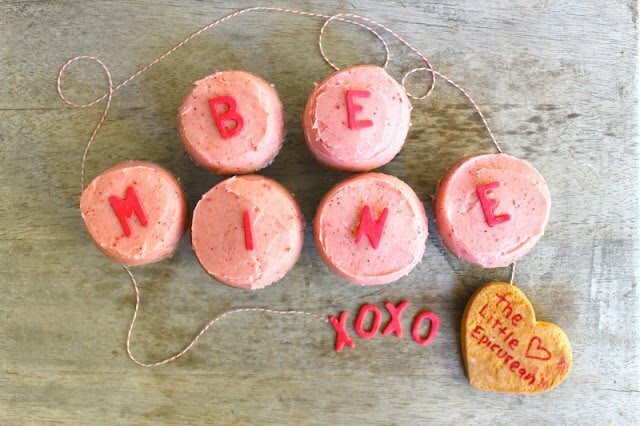 So this year, make your Valentine feel super special with these homemade cupcakes. Maybe she won’t mind that you didn’t attach the diamond earrings to the box. Preheat oven to 350 degrees F. Prepare muffin tin with cupcake liners. Whisk together flour, baking powder, baking soda, salt, and ground freeze dried strawberries. Set aside. In another bowl, mix together strawberry puree, buttermilk, and vanilla. Set aside. In the bowl of a stand mixer fitted with the paddle attachment, cream together butter and sugar until light and fluffy. In a small cup, whisk together whole egg and egg whites. Slowly add egg mixture into the butter mixture on low-medium speed until combined. With the mixer on low, alternate adding flour mixture and buttermilk mixture. Start and finish with the flour. Scrape down the sides of the bowl with a spatula in between additions to ensure ingredients are thoroughly distributed. Divide batter evenly among the prepared muffin tin. Bake for 20-25 minutes until a toothpick inserted in the center of the cupcake comes out clean. Let cupcakes cool in muffin tin until cool enough to remove and transfer to wire rack to cool completely. Cupcakes are ready for icing once they are room temperature. Soak ground freeze dried strawberries in strawberry puree. Set aside. In the bowl of a stand mixer fitted with a paddle attachment, cream butter and salt until light and fluffy. On low speed, slowly add confectioners’ sugar. Beat until well combined. Slowly add puree mixture. Mix until just combined. Do not overmix. Once cupcakes are at room temperature, they are ready for frosting. Let frosted cupcakes sit at room temperature for 30 minutes to an hour for frosting to harden slightly and set. Thank you! It took me a couple tries to finally get the frosting to look like that. Fruit in baked goods is not that easy to pull off, so I am glad to come across this recipe. You have some very good tips here on using the different fruit products that are out there. Glad to stop in and learn as well as find a tasty recipe. Your pictures are fantastic. Thanks for posting. Thanks, Tina! I love fruit in baked goods. Its just hard to get the fruits from getting mushy and turning brown or grey. How adorable are those cupcakes! The color is so vibrant and pretty, I can’t wait to try this recipe out – they are frosted so perfectly too! Yes! Isn’t Trader Joes the best?! I always leave that place with more stuff than I intended to buy. What did you use to create those little dot decorations? They’re so cute and make them look just like Sprinkles! :) And, can I use vanilla extract instead of paste? I used fondant to make to the little dots. I colored regular white fondant and rolled it out really thin. Yes, you can easily substitute vanilla extract for vanilla paste. 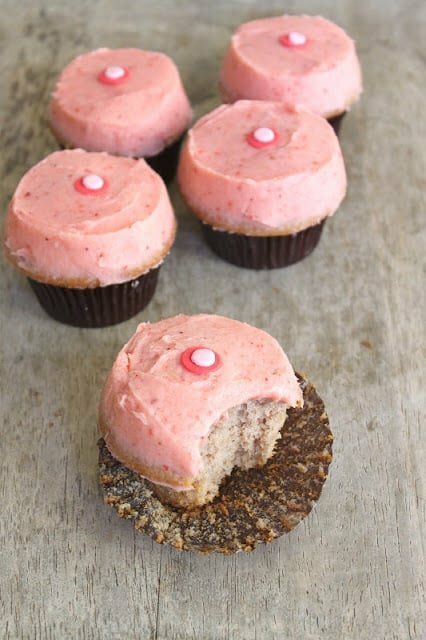 I used vanilla paste in this recipe because I wanted the little speckles of vanilla beans in the cupcakes. Is your strawberry puree sweetened or just straight pureed strawberries? Could you use vanilla extract as a vanilla bean paste sub? Hi Hallie, yes vanilla extract works fine. I wonder if you think this recipe would work using a different fruit. I have peaches in mind. Any thoughts? Yes! I think peaches would work in this recipe. Sounds like a great idea. I’m going to have to test that out this weekend. Would these stand up to heat at all? I am hosting an outdoor party and I would hate for them to melt. Hi Kat, over time the frosting slightly hardens on the outside creating a shell. The frosted cupcakes should hold up outside as long as they are in a shaded area. Direct sunlight will definitely melt the frosting. If you have room in a cooler or ice box, I suggest storing them in there for safe keeping. Hi! These look yummy! How long will cupcakes with this frosting last sitting out? They would be indoors but not in a refrigerator, just sitting on a table. Thanks! Hi Stephanie, the frosted cupcakes should last for a day sitting out. As the frosting sits out it will harden on the outside, but remain soft on the inside. What do you mean by slightly cold butter. Also, can these cupcakes be refrigerated after they are frosted. Also, did you watch a video on how to frost those cupcakes. I suggest taking cold butter and letting it sit at room temperature for 5 minutes before using. Yes, cupcakes can be refrigerated but they need to be brought back to room temperature before serving. Sorry, no I did not watch a video to frost the cupcakes. 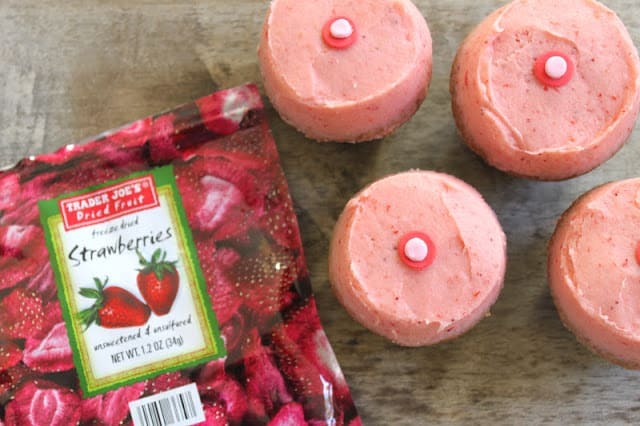 If I double the freeze dried strawberries amounts in the cupcakes and frosting batters, do you think it would mess up the recipe. Hi! Have you made this into a cake? If so, how would I go about doing it (same amount of ingredients)? I made these cupcakes and they are fantastic! I am not a baker, so I don’t know if this is an easy transition into a cake. Thank you!